1. Save money – for starters there are no replacement filters and nothing to clean. The air purifier uses 2 AA batteries that require replacement approximately every 45-90 days. Built-in micro processor controls the operation of the air purifier so it will cycle on and off to save battery life. 2. Silent – no fans. I love how it is silent and clean looking. I don't love having to replace batteries, but it's actually helpful for me because I more readily have batteries around than extra boxes of baking soda that I would ALWAYS forget about replacing. Plus I don't think baking soda ever worked this well. This fresh clean fridge smell I currently have has only existed at my house after I've completely cleaned out my fridge. As for keeping my food fresher longer...I'm not sure if I've noticed this. My food is certainly not spoiling quicker! I can say this...lately I've been buying our bread at the local bread thrift store. Bread is super cheap because the expiration date is approaching. As soon as I can I put the bread in the fridge and I haven't had trouble with moldy bread yet!! Which is actually funny because before when I would just buy regular bread and leave it on the counter I always ended up throwing some out even before the expiration date. The Oransi Ionic Fridge Air Purifier retails for $29.99 and ships FREE! Keep up to date with Oransi Products on Facebook and Twitter! So I hope you have Pinterest because you'll need it for this giveaway. Good luck!! 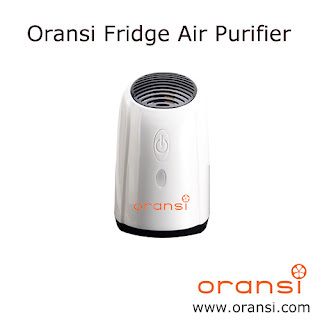 One reader will win a Oransi Ionic Fridge Air Purifier! US Only and no PO boxes. To enter Pin the first Oransi picture with the link to this giveaway post. Sounds like a good idea! My fridge could certainly use it! Would love to win this!! I sure could use it. Thank-you for so a great giveaway. SWEET! I need one anyways, it'd be great to win one! good giveaway, i need one of these with 2 teenagers in the house! I put this on my "Being Green" Board, but I'm not sure it really is compared to good old-fashioned baking soda! Still would love to win it! I feel like this air purifier would make our home healthier. Thank you for the giveaway!! I so need one! This is awesome! Thanks for chance! Would love this! Thank you for the chance! I'm keeping my fingers crossed. Thanks. Mr fridge could use this!! So in need of this! What a great product to give away! This is such a great idea...looks really compact...I would love to win it for my mom for Christmas!!! Love to win this. Thanks for the giveaway! Love your site!! Great product! Would love to win! Thank you for having an awesome giveaway. Our fridge could definitely use this! Would love to try this and get rid of the box of baking soda!